When we decided to build a go kart we didn't know where to start. We did a lot of research on the internet and found a bunch of sites that had go kart plans for sale. We didn't want to buy go kart plans so we took the knowledge we had and went to work. It was difficult to figure out how to put a go kart together as we had no prior experience with go karts, but we were able to sort it all out. We are basically sharing our experience building go karts to help others who want to build a go kart and do not know where to start. There are many things we would do differently on our next go kart and we don't expect people to think our go karts are the greatest in the world. The information on this website is only intended to be used as a guide. We can all learn from someone else's trial and error so we hope the information we have shared will help point you in the right direction with your go kart build up. The yard kart that we built from scratch ended up costing us over $600. There isn't anything special about the kart. The problem is all of the nuts, bolts, washers, bushings and other small pieces it takes to put a go kart together really add up. The Azusa Fun Kart we put together ended up costing a little over $500. Again, there isn't anything special about the fun kart, but all of the parts add up quickly. We did not build the race karts pictured above. We purchased them used. 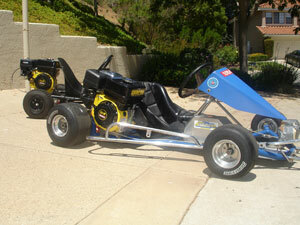 Both karts were complete when we bought them and they were $400 each. We sold the Briggs engines that were on both karts because they both needed a rebuild. We used the money to purchase brand new Honda clone engines and had money to spare. We used the spare money to replace some worn parts. In the end, we have $400 invested in each kart, much less than the yard kart and fun kart we put together. These race karts were built in the 90's and are no longer competitive, however, these are high performance machines compared to the fun karts. These karts have a professionally built, adjustable racing chassis, strong 1 1/4" axles, hydraulic brakes and comfortable seats. 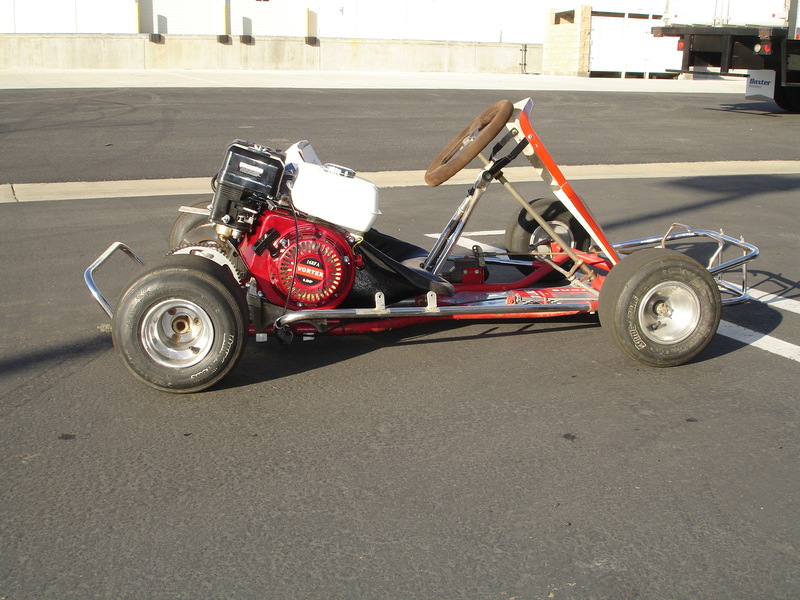 The race karts are light weight, fast, nimble and stop on a dime. Everyone enjoys driving our race karts much more than the other two karts. We are happy about the fact that they were so much cheaper too. We are not trying to discourage anyone from building their own go kart, we are simply sharing our experiences so you can make and informed decision as you get into the go karting hobby. We hope you have found this website useful. Good luck with all of your go kart projects and happy karting!